NOTE: I wrote this several years ago on my previous blogsite at Blogger. I have reposted it nearly every year since, and do so again in observance of the day when we lost the Space Shuttle Challenger and all seven astronaut crew members on board. It was seventy-three seconds after lift-off on January 28, 1986 that the Space Shuttle Challenger exploded, killing its entire seven member crew, which included a high school teacher, the first private citizen to fly aboard the craft. I was working with NASA as a public information officer attached to the press site at Kennedy Space Center. My job that morning was to deliver pre-launch commentary at the communication console inside the Launch Control Center at the Cape. I began my shift at the microphone at about 3am, about the time the tanking operations got underway when millions of pounds of pressurized hypergolic fuels were being pumped into the behemoth at Launch Pad 39-B as the seven astronauts breakfasted before suiting up for the big event. I would continue commenting on the launch prep until the astronauts were driven to the launch pad. Launch commentary emanated from Kennedy Space Center until the shuttle lifted off and cleared the tower. From then on, the launch became a “mission”, thus the commentary from that point would be undertaken by mission control in Houston. It was cold in the pre-dawn hours. It was still dark when I left my home bundled in a winter coat. I could see my breath — unusual for Florida. When I arrived at the LCC (Launch Control Center), my supervisor, NASA Public Affairs news chief Hugh Harris, was already seated at his communications console, headset on. I slid into the adjacent chair and opened a 3-ring binder that contained the launch sequence and milestones that I would be talking to, explaining to the public — the taxpayers — in simple language exactly what was taking place. “No anomalies” Harris advised me in NASA-speak, meaning everything was proceeding normally. I took over the mic, offering comments as the launch team hit significant milestones in the countdown sequence. And so it went as the clock ticked forward smoothly toward an 11:38 a.m. liftoff. The seven suited-up astronauts began their departure from crew quarters in the Operations and Checkout “O and C” building, located about three miles away. NASA cameras, along with national and international TV media, were trained at the exit way where they would do the “walk-out”, waving at those cameras and at an assemblage of cheering NASA and contracted workers as the silver-suited astronauts made their way into the silver Airstream “Astrovan” for the ride to the launch pad. As they strode toward the TV cameras and the van, I keyed the mic to describe their walkout. Little did I know those words would be heard thousands of times in the aftermath of the shuttle explosion, as TV news programs replayed the last moments we saw the Challenger Seven alive. During all of this time, there was great concern among the Launch Control engineers about the cold temperatures at the launch pad. Some advised against a launch, arguing that the rocket boosters’ O-rings had not been tested for such a cold environment, and it was not certain they would perform within design parameters. But others in more senior engineering positions prevailed for a lift-off. Many believed they felt pressured to launch lest they be the cause of a delay that would cost NASA millions of dollars. And besides, everyone in the world was tuned in to see Christa McAuliffe become the first Teacher in Space. Throughout the pre-dawn morning a team was sent with long broom-like stick handles to break up the ice that had built-up under the shuttle. An infrared camera focused on right-hand solid rocket booster aft field joint revealed the ambient temperature at a mere 8°F. Discussion on temperature concerns continued throughout the morning, albeit outside of our comm loop. Ultimately, after much haggling among several key engineers, the fateful decision was made to proceed, and the clock ran steadily for launch. Finally, we hit the T-minus ten second mark. At this point, our commentary was done. I swiveled around to face the glass floor-to-ceiling window behind me and watched Challenger rise away from the pad. As she climbed, a gorgeous billowy white column rose underneath her, the twin solid rockets and three main engines glowing brilliantly like blinding sunlight against a cold and deep blue sky. Those were the last words we ever heard from Challenger. About 73 seconds into the climb, at 48,000 feet over the steely blue Atlantic, the O-ring failed to seat, allowing a blow torch of super hot solid propellent to set a chain of events in motion that caused the Challenger to break apart. The gorgeous contrail split into a Y shape, my first clue that something had gone awry. Instantly, I saw a single rocket spiral outward, unattached from the mother ship. Firework-like smoke and streamers burst forth from the center, ghastly tendrils turned a sickly orange color as gravity pulled them earthward. We were witnessing a catastrophe. I didn’t breathe. I knew that we were watching the awful death of seven of our own. The room went silent except as systems managers stared at frozen computer screens. All data flow from the shuttle had ceased. At every console, stunned engineers’ heads dropped in shock and sorrow. Yet within moments, the launch control team regained its composure and snapped into action, beginning the drill for which they had practiced and rehearsed for just such a moment, one they prayed before every launch that they would never have to use. Having worked with the astronaut team for months, they felt it personally. Part of the process included locking doors, shutting down telephone communication with the outside world, and carefully running through checklists that would ensure that relevant data was correctly recorded and preserved. All materials, including my three-ring binder and my purse, were embargoed. Nothing would be carried out until it had been thoroughly examined. Hugh Harris hurriedly stepped away from his console to consult with NASA’s Public Affairs director, political appointee Shirley Green who had made the trip from Washington DC to be there for the big event, and was now watching the catastrophe in stunned bewilderment. President Ronald Reagan and his staff reacted to the news as they watched it on a television in the Oval Office Dining room. In this room, the president might occasionally have casual meals alone or with his staff and catch the news on television or discuss White House policy. Because this room is usually furnished with a small television, it is often here that the president first sees news events being reported from around the world. A short time later, President Reagan appeared on TV monitors worldwide, offering words of condolence and comfort to the nation. The position afforded me open-door access and a bird’s eye view of every meeting held with key NASA engineers and astronauts assembled to sift through every piece of data. 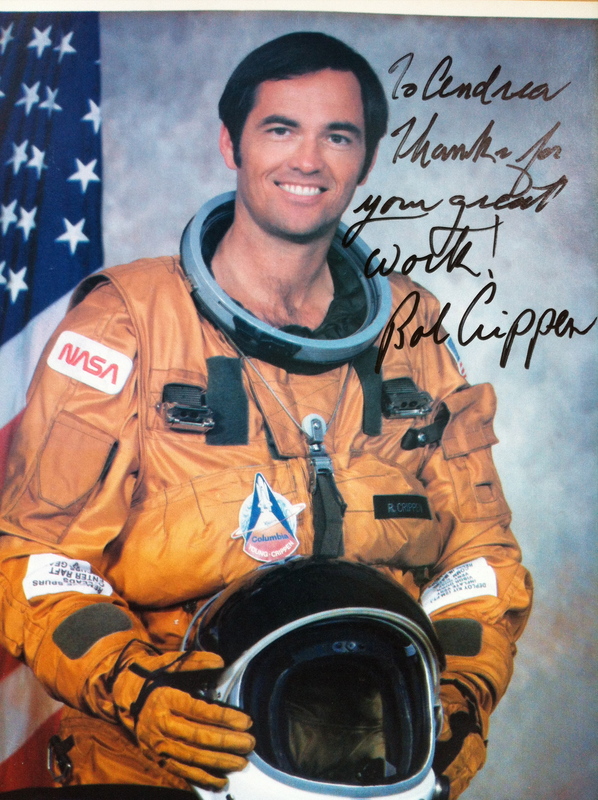 I worked out of Bob Crippen’s office with the famed astronaut and his staff. One of my first duties was to visit the temporary hangar that had been erected at nearby Canaveral Air Force Station to house the salvaged pieces of the Challenger as they were retrieved from the ocean floor. When I arrived there, much of the orbiter had been salvaged and laid out in accident investigation fashion, like piecing together a huge puzzle. The crew cockpit and mid-deck were twisted and shattered, a haunting reminder of the crew’s last moments as they slammed into the ocean at some godawful speed. The hangar was to many, a holy place, where one spoke in hushed voices, as they viewed the craft re-assembled as best it could be, the charred surfaces visible where the solid rockets had burned through the shuttle’s tiled wings and fuselage. Burned bits and pieces was all that was left of the once-proud Challenger. That morning, I was 50 miles away in a Navy classroom in Orlando. I had seen the last launch up close and was bummed I couldn’t go to this one as well. Five minutes before our lunch break, a CPO poked in his head and said, “the shuttle just blew up.” Actually, most of us laughed because the thought was ridiculous. Sophisticated, modern rockets didn’t just “blow up” – at least not in our class’ 19 years watching flawless launches on TV. When we looked at his stunned face we realized it was no joke. They let us out of class and we all stood there staring at the spiraling smoke trails far to the east. It took about an hour and a half for the wind to blow it all away. Oh wow. I was a senior in high school and our entire class was watching. We Wyoming kids were so excited because our teachers were so excited. It took a while for it all to sink in as to what happened that day. However, I can tell you that many of my classmates are teachers now . . . some who hadn’t even thought of that profession. I wonder if that day was part of what made the difference? Andrea, I was in Jr. High School in jacksonville, FL when this happened. I remember our teacher taking us out to watch the launch trail and being very confused when the single plume turned into many. Our teacher quickly ushered us back inside the classroom. She had a strange demeanor for the rest of class. I didn’t find out exactly what happened until that night. My wife was there, on the beach south of Canaveral, watching with her father and her sister. Her mother had died during heart surgery the week before, and they had gone to watch the launch to try to get out from under the grief for a little while. It didn’t work out that way. I was in a meeting in Dallas, and we took a break to watch the launch. I will never forget the sick feeling when the shuttle blew up. It must have been even more terrible for you. What was NASA thinking, launching a shuttle on one of the very rare cold mornings in Florida? Up here in the North, we know that any machine is much more likely to fail when it is cold. What a waste. And I proceeded to talk for most of the evening with the guy NASA hired to pick the pieces off the ocean floor. No one gets outta life alive. Those that take huge risks sometimes leave us far too soon… But bless ’em for taking the risk, so that the rest of us might learn. I was standing in front of my TV as they boarded, with a fearful knot in the pit of my stomach. I started saying “Don’t go–don’t go–don’t go—-etc.” until it blew up. I was devastated. I still am–that I couldn’t stop them. Like most of us it is a day I will never forget. We can only thank them for their service and the media for being there with the laborious responsibility to record it so we can share, remember and honor those that perished and gave all of themselves that we left behind can benefit from the science they gave us. I too have an indelible memory of that day when the Challenger exploded after launch. I was a TWA pilot based at JFK. I was scheduled to travel from JFK to St Louis on January 28, 1986 in order to attend scheduled training at the TWA Training Center in St. Louis. I was given a seat in first class on the B-767 flight to STL. Upon boarding the aircraft, I realized that the video screen in the first class compartment had been lowered to permit the seated passengers to monitor a live TV news broadcast. It was apparent that everyone who could see the screen was transfixed by what they were seeing. 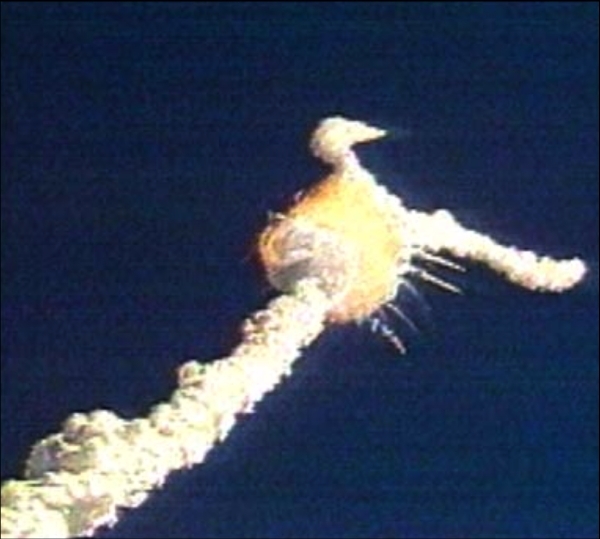 I turned to look at the screen and was immediately confronted with the unforgettable image of the exploding Challenger launch vehicle. I was stunned by what I was seeing on the screen. Shortly thereafter, the screen was stowed and the aircraft departed the gate. 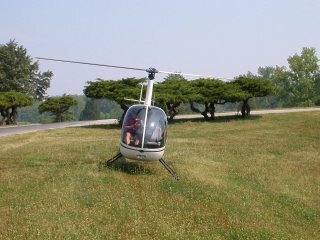 All of the passengers were virtually silent for the entire trip. We could not get the awesome implications of what we had seen out of our minds, nor could we stop thinking about what those Challenger crew members had just experienced, and the impact it would have on their families and on the U.S. space program. I watched William Hurt’s portrayal of Richad Feynman yesterday and Ill always remember this quote shortly after word came through they’d found the astronauts and their PEAPs had been activated (Im not sure if he actually said it but nevertheless it is certainly something he wouldn’t have been afraid to have said). Chairman Rogers was admonishing Feynman for doing too much ‘boy scouting’ (independent work) and that the other commission members are being respectful. Feynmann (takes off glasses): And you’re saying I’m not? You understand don’t you the implications of the oxygen being activated? I do. It means the astronauts had to do that themselves which means they were ALIVE for at least some of those 2 mins 36 seconds before slamming into the ocean (no pause) Mr Rogers Im an atheist and while I personally doubt they’re touching the face of God I prefer to show my respect by finding the CAUSE of their appalling deaths and not just stand around looking sad! I never wanted to be on this commission but now that I am I intend to find out what went wrong. And hey, I DONT know that Nasa’s done an excellent job” (In reference to Chairman Rogers warning the other members not to be undeservedly critical of Nasa and their record of excellence).